Take the Dalin ( 大林 ) Exit toward Dalin. Turn right onto No. 1 Provincial Highway ( 台一線 ) toward Minsyong ( 民雄 ) and Chia-Yi, and then drive about five to six kilometer, our hospital is on your right. Take the Chia-Yi Exit toward Chia-Yi urban district, and merge onto Beigang Road ( 北港路 ). Turn left onto Boai Road ( 博愛路 ), keep going straight crossing Boai-Bridge ( 博愛路橋 ). Do not turn right. Then turn left onto Jhongsiao Road ( 忠孝路 ), and drive about 500 meters. The hospital is on your left. 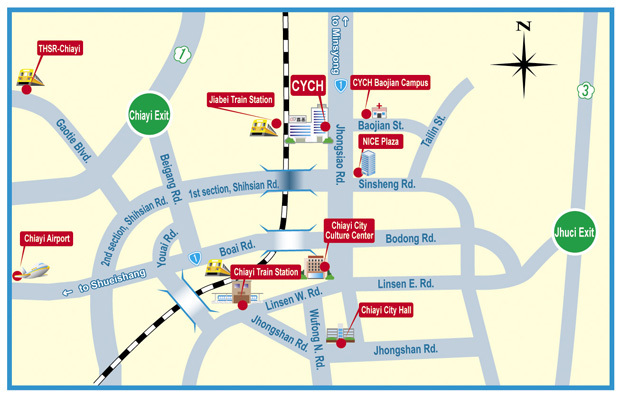 Take the Chia-Yi Exit toward Chia-Yi urban district, and merge onto Beigang Road ( 北港路 ). Turn left onto the first section of Shihsian Road ( 世賢路一段 ), and you will go through an underpass, then turn left onto Jhongsiao Road ( 忠孝路 ). Drive about 200 meters, the hospital is on your left. Take the Shueishang ( 水上 ) Exit toward Shueishang, and turn left onto No. 1 Provincial Highway ( 台一線 ). No. 1 Provincial Highway will become Boai Road ( 博愛路 ). Go straight toward Chia-Yi and Minsyong ( 民雄 ). Go straight across Boai Bridge ( 博愛路橋 ). Do not turn right. Then turn left onto Jhongsiao Road ( 忠孝路 ) Drive about 500 meters. The hospital is on your left. If you just passed Shihsian Road ( 世賢路 ), drive about one kilometer, and you will merge onto Boai Bridge ( 博愛路橋 ). After crossing the bridge, turn left onto Jhongsiao Road ( 忠孝路 ), drive about 500 meters, and the hospital is on your left. Take the Jhuci ( 竹崎 ) Exit toward Chia-Yi. Drive about 800 meters, turn right onto Linsen East Road ( 林森東路 ). Then turn right onto Jhongsiao Road ( 忠孝路 ), drive about 800 meters, and the hospital is on the left.